The bad photo shown here is the only photo I took of Idaho Falls. Why? It is not a bad town, but not what I would call beautiful. First off it is very flat, with foothills to the distant east. These foothills are completely barren. Secondly, aside from the smallish downtown, the commercial areas are primarily fast food stores and chain stores, lining wide rough roads. The ho-hum aesthetics and lack of character gave me little reason to stay here except to eat, wash my car, and use the downtown library free wi-fi. According to Forbes magazine, it is a great place to do business, presumably due to low corporate taxes. (Employee wages are pretty low, too). Housing here is really cheap. Yellowstone and the Grand Tetons are about 75-100 miles away, which isn’t really all that close but also not too far away. There is a nice farmer’s market downtown on Saturdays. The public library is nice. The town does come across as “too small” with little to do here, not to mention it is basically in the middle of nowhere. I was happy to take off for Yellowstone and start seeing a lot of trees again. Hm. Not the most flattering photo of my hometown. Did you check out the zoo? And, I’m surprised that you didn’t mention the intense LDS influence, which is the most distinguishing feature of I.F. I agree with Jackie. Not the most flattering picture. Could have taken pictures of the river as well. I could think of a more flattering places to take a picture of besides the highway. Ouch! You went from this point to the library, passing the greenbelt, and this is the only picture you took? I’m sorry you missed the opportunities on both sides of the road. Awww, who am I fooling? We have some problems, and hopefully we can fix them by the next time you visit. One identified problem is our poor signage. How could you know there is anything interesting to do in Idaho Falls if there are no signs telling you, or the signs are small and of poor quality. Thanks for the splash of cold water. We are working to improve things in our city at http://www.idahofallz.com. Have son and family in Idaho Falls. Going to visit end of May. A ‘GREAT TOWN’ to visit and live. Our son has been there 10years having moved from Southern California to raise his family. I have many pictures of the town from our family visits and I assume all you read these comments and view the one picture that there is more to this town than what was quoted. PS: just for the record, I am not LDS. The other day I read an article in the book Leanings by Peter Egan (one of my favorite authors), and in it Peter also heaped some accolades onto Idaho Falls, especially the region near the park with the falls. Alas, I missed that. Great to see people enjoy living in that city, though! 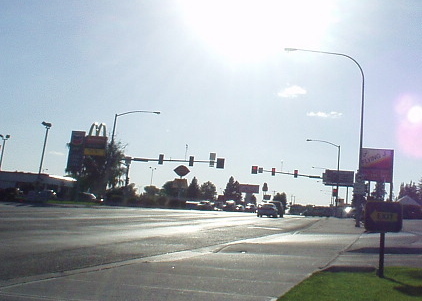 Trees or not, flat or not, Idaho Falls is where I grew up, and it’s not as dumpy or dreary as you placed it. There are things to do if one takes the time to find them out. Aside from the small town feel, Idaho Falls isn’t as small as I remember it growing up. With a car, one can travel out towards the Grand Teton National Park, Yellowstone national park, and the Sawtooths over by Stanley, Idaho. It helps kill off that ‘dreary’ feeling. Idaho is barren, flat, and ‘dull’ at points.. BUT, where I live now (Santa Cruz mountains, California), I’d give a million to have that barren, vacate feeling again — there’s too much here, not enough there! And that’s what makes Idaho Falls a great place to live!